Exhibit opened Wednesday, Oct. 24, will close April 30, 2019 and features 14 photographers, 10 of which still work for the PRCA, dating back to the 1960s. Without these dedicated men and women, rodeo’s history would be a lackluster list of locations and participants. Instead, it is a rich, colorful tapestry. Full of amazing moments captured on glass plates, film, and digital hard drives. 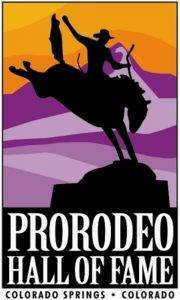 Since 1979, the ProRodeo Hall of Fame has been an educational and entertaining museum designed to preserve the legacy of the cowboy contests, the heritage and culture of those original competitions, and the champions of the past, present and future. Without the continue support of sponsors, members, and rodeo enthusiasts, the Hall wouldn't be able to continue it's legacy. Consider donating or becoming a member TODAY! These upcoming ProRodeo Hall of Fame events are all open to the public. Reservations are required for some events. To be added to our mailing list call 719-528-4732. Additional information about each event will be added as they become available. April 19, 2019 – Western Spirit coloring contest deadline. Click here to print coloring sheet. May 1, 2019 – Museum switches to summer hours. We will be open 7 days a week from 9am-5pm until September 1st. 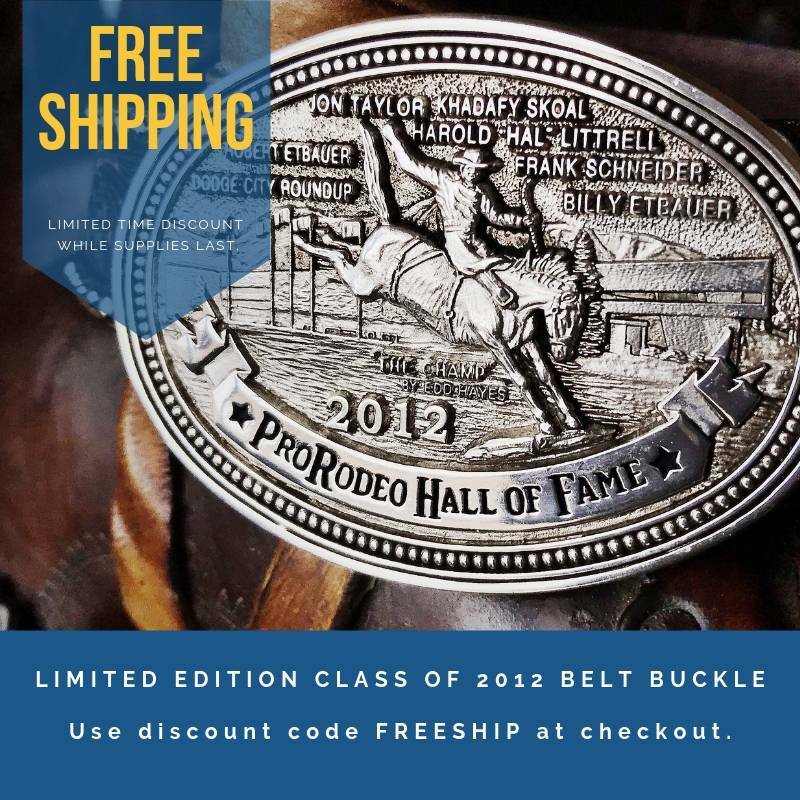 Click image to buy buckle. Hoover and click over image to open review. 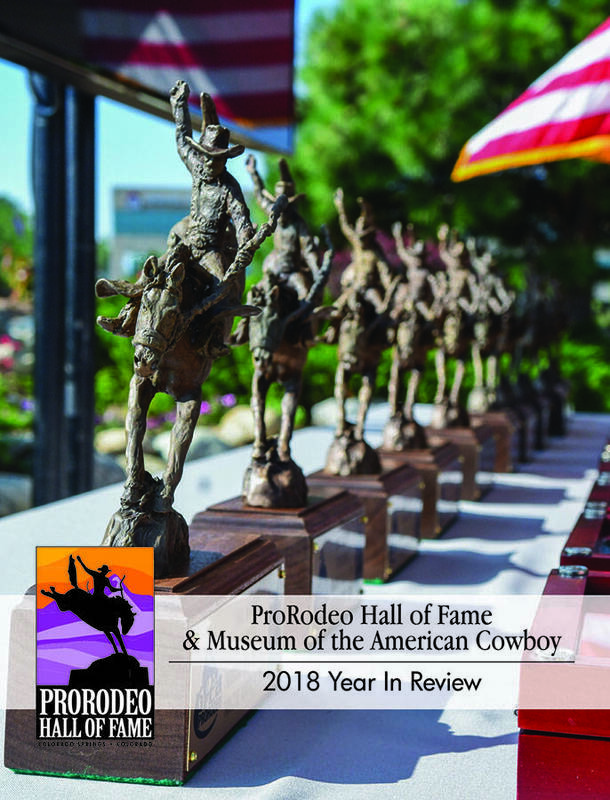 The year 2018 was an exciting and successful one for the ProRodeo Hall of Fame and Museum of the American Cowboy. It started off with us welcoming a new President of the Hall of Fame, Mr. George Taylor, CEO of the Professional Rodeo Cowboys Association in January. Admissions to the museum remained flat for 2018 compared to 2017, however, the month of July alone was up 16.7%. We had a very busy summer with events, guests and our annual Inductions with 10 new Inductees enshrined August 3 and 4. We acquired a new software program to house our collections data. This program allows us to present our entire collection digitally on its own website for all to view. People all over the world will be able to use our database for research, learning more about their favorite rodeo champion as well as looking through our museum via their computer. Over 21,689 items have been imported into the program and are now available for viewing digitally. We conducted a year-end holiday giving campaign for the first time in several years. This resulted in $5,400 in donations as of January 7. Our fund-raising efforts also included starting a Rodeo Committee Membership that was launched in the last quarter of 2018 allowing PRCA sanctioned events the opportunity to support the Hall of Fame and promote their rodeos. The New Year of 2019 will see more projects enhanced and new ones implemented. We have added two categories to the Hall of Fame Membership program – Lifetime Member and Student Member. We will advance a volunteer docent program for the museum. We will welcome Hall of Fame Trustee Emeritus positions that will serve as honorary trustees offering ideas, support and mentoring to the Hall. The Class of 2019 selection will have improved processes and procedures. A capital campaign is being organized to kick off this year to provide for major improvements and additions to the museum in the future. A redesign of the Hall’s website is planned. A quarterly newsletter to all Hall of Fame supporters will be produced. The Hall’s sponsor programs will be expanded. Special events being planned for 2019 include a Youth Rodeo Festival this summer and a 40th Anniversary Celebration to coincide with our annual inductions in August. I want to thank our Board of Trustees, sponsors, donors, patrons and guests for all they contributed to make 2018 so successful. I especially want to thank the Hall of Fame and Facilities Staff for their hard work, dedication and commitment to the ProRodeo Hall of Fame. Without their contributions, work, support and talents, we could not reach our goals and continue to meet our mission.